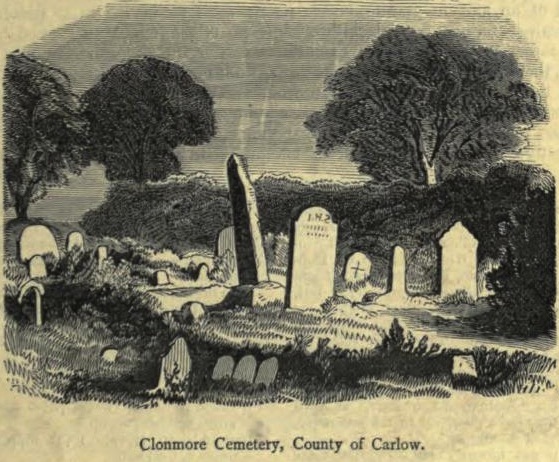 ST. MAEDHOG AEDHAN, OR MOGUE, ABBOT OF CLUAIN-MOR-MAEDHOG, NOW CLONMORE, COUNTY OF CARLOW. 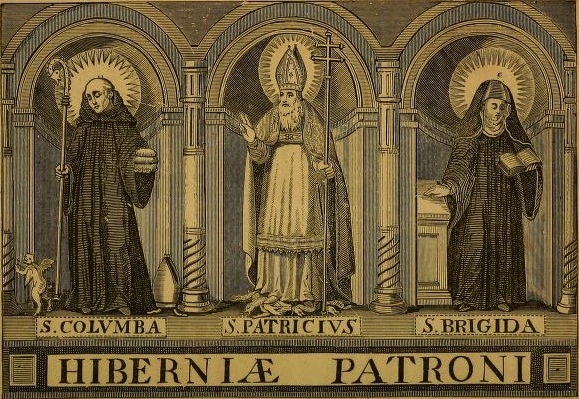 THAT the present holy Abbot's memory had been revered and celebrated, at an early period, in the Irish Church, is evident from various circumstances. His recorded name of Maidoc, or Moedoc, was originally Aedhan; in Latin, it was Aedanus, and it has been Anglicised into Aedan. The Irish diminutive was Aedh-og; and, by prefixing Mo, or my, we have Mo-Aedh-og, or my young Aedh, hence comes Moedhog, or Mogue. Again, Momoedoc, Mionn Gaoidhel, or "my Maidoc, sacred pledge of the Irish," were words of endearment, applied to saints bearing this name. ..However, as there were three saints, bearing the name of Aedhan, or Maedoc, and who were very nearly contemporaries, in the absence of more ancient records, there can be no more embarrassing task for a student of Irish hagiology, than to fix their respective actions. Colgan apparently had a Life of Abbot St. Maidoc, of Clonmore, ready for publication, at this day; and, he promised, that at the 11th of April, much should be discussed concerning him. The Bollandists merely notice his festival, as occurring at this date, in the Martyrology of Tallagh but, they have evidently misprinted his name, which was to be met with in the original. …The birth of our saint took place, probably before the middle of the sixth century, but the year is not known. This holy Abbot's chief house was situated, it is thought, at the present Clonmore, in the Barony of Rathvilly, and County of Carlow. The exact year when it was founded has not been ascertained; and now, there are no vestiges left of the ancient building… According to tradition, the whole valley, extending from Clonmore to Aghold, in former times, was called "Mogue's great glen," or "Mogue's big lawn," or "Meadow;" while a portion of Clonmore townland, to the westward of the high road, and south of the old castle and cemetery-ground, is called, at the present day, the Big Meadow. On the Ordnance Survey Maps, it is even thus designated. A delightful place of resurrection, in which are the relics of Erin's saints. With Moedoc, descendant of Dunlang, are their graves." In the Feilire of St. Aengus, at the 11th of April, St. Moedoc is recorded, with a special commendation. Again, Moedoc h Dunlaing, in Cluain Moir, is set down, in the Martyrology of Tallagh, at this date. On this day is registered, in the Martyrology of Donegal, Maedhog, of Cluain-mor-Maedhoc, in Leinster. Aedh was his name, likewise, as we are informed.